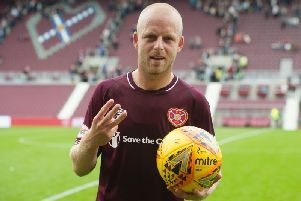 Today sees Hearts realise pre-season ambitions by starting a run of five matches in the Ladbrokes Premiership’s top six. Finishing in the top half of the league was, of course, the club’s pre-season aim – an expectation very much exceeded in the intervening nine months. European football and a minimum placing of third are already secured after an outstanding campaign back in Scotland’s top flight. Catching Aberdeen and claiming second place remains a distant, although not impossible, hope harboured by those at Riccarton. Hearts enjoyed a weekend off last weekend like other Premiership sides not involved in the Scottish Cup semi-finals. Since the 0-0 draw in Inverness which confirmed their place in Europe, they have regrouped and are ready for the challenge of trying to finish the season strongly. Even if they cannot overhaul Aberdeen, any momentum built over the next five games can be crucial if it is carried forward to the Europa League qualifiers. They begin drastically early on June 30, so there is plenty resting on the final league fixtures. For other managers, there may be a temptation to experiment with emerging young players. Hearts head coach Robbie Neilson won’t change too much, though. “Yes, younger guys like Dario Zanatta and Liam Smith will get a bit of game time but the most important thing is to win games. There’s still an opportunity for us to get to Aberdeen,” he stressed. “We’ll know more over the course of this weekend and the following weekend. That will tell us where we are. If it’s looking possible, then we keep going and put the pedal to the metal. If we can’t do it, then we need to start looking at giving some players opportunities. We’d still want to win games but we could then give some younger guys game time and see where they are. A run of six wins in eight games saw Motherwell surge into the top six under manager Mark McGhee. Appointed as recently as October, his second spell in Lanarkshire has been a rousing success so far. “Mark is a very experienced manager and you can see what he’s done,” commented Neilson. “He’s come in, he’s looked at his squad, he’s got a formation and a style of play that suits the squad first and foremost. The way they play, they don’t open up a lot. For Hearts defender Callum Paterson, returning to the Premiership has been an enthralling experience. He was part of the team relegated to the Championship two years ago but has been a key figure in the club’s on-field rejuvenation since then. “It’s been great. It’s just a different standard with everything - pitches, players and stadiums. It’s great to be back in the Premiership. We’ve done well so far and hopefully we can kick on,” Paterson said. “I’ve played in Europe before and some of the boys have as well. They know what it’s like. So it’s always an aim to get back there. For the boys that haven’t been there, it’s going to be a massive boost for their confidence. “It will be a pretty early start. The first game is on June 30 so we’re back in a bit earlier. It’s not a bad thing. The boys won’t be complaining about coming back in early and training to play in Europe. I hope we can get a couple of good teams and progress. Paterson’s own aims for the next five games are realistic after he recently recovered from six weeks out with a torn shoulder ligament.